TheTruth is French-Canadian, born in 1991. She has moved 6 times and is a fan of the X-files. She loves to draw and has a gift for hurting herself with any object crossing her path. It's been ten years since Diana, Princess of Wales, died suddenly in a car crash in the middle of the night in Paris. It was a shocking end to a life that had been increasingly defined by controversies and scandals since the moment when Lady Diana Spencer became HRH The Princess of Wales. On 29th July 1981, Prince Charles married the shy young English rose who had been championed by the popular press ever since she was identified as his latest girlfriend. Lady Diana's beauty, charm, and innocence captivated the royal reporters and photographers, who decided that she would make a perfect Princess and future Queen and who filled their newspapers with photos and stories in support of her. The relentless lobbying by the newspapers and the resulting overwhelming public interest in Lady Diana put so much pressure on Charles that he had no chance to withdraw from the relationship but ended up proposing marriage somewhat against his better judgement. The reality of the marriage was very far from the fairy tale concocted by the press. Diana and Charles had entered their marriage with quite different expectations, and this created stresses in their relationship from the start. From Charles's point of view, marriage and fatherhood was first and foremost part of his obligation as heir to the throne. His views of marriage had been influenced by Earl Mountbatten and the Queen Mother, both of whom wished to see him married to a daughter of the nobility whose pedigree was deemed by them to be worthy of inclusion in the royal family. Diana, on the other hand, was a child of the 1960s from a broken home, who had grown up reading the Barbara Cartland romances and was looking for love, security, and emotional fulfillment. Their incompatibility grew to intolerable levels over the years. In 1992, after nonstop speculation about the state of the marriage in the tabloid press, the Princess went public with her story in Andrew Morton's book Diana: Her True Story, and the fairy tale was shattered. Three more years of "The War of the Waleses," waged in books and newspapers and on television, culminated in Diana's Panorama interview, where she blamed the royal family for her difficulties and hinted that Charles was unsuited to be King. The Queen responded by telling Charles and Diana that they should divorce as soon as possible. The divorce was made final in 1996, and the royal family must have wished to never hear any more about Diana after she left their ranks. Instead she was as popular as ever, and continued to upstage the royal family as the press avidly followed all her public and private activities. By August 1997, Diana was romantically involved with Dodi al Fayed, the son of Mohamed al Fayed, an Egyptian billionaire hated by the British Establishment. She and Dodi were together on a Mediterranean cruise and then in Paris, being trailed the whole time by hordes of photographers. We all know how this French trip ended: a dead princess almost canonised by the media which had so recently been hounding her, and a grieving nation turning its anger against the royal family. After years of very public scandal and ridicule that compromised the monarchy, her death was another blow for the world's best-known kingdom. And it hit the monarchy hard. In the days after her death, when the royal family remained in seclusion at Balmoral, public anguish hardened into vengeful anger against the Queen and Prince Charles and came very close to precipitating a terrible crisis. People were beginning to talk seriously about doing away with the monarchy. How could a dead woman of 36 have such a devastating effect on a thousand-year-old institution? Diana's tragic death and its aftermath set off an earthquake under all the European royal families. If a girl marrying into an institution as seemingly secure as the British monarchy could destabilise it so seriously, how easily would the other monarchies survive the effects of an unsuitable marriage of the heir to the throne? Over the last two centuries, the influence of royalty decreased considerably as people came to see republics as the new power with their modern emphasis on democracy and representative government. The French revolution in 1789 was the first successful large-scale challenge to the institution of monarchy in Europe and led to the abolition of the French monarchy in 1848, after the Monarchie de Juillet (1830-1848). The end of a monarchy considered to be one of the most powerful of its time set a precedent for other countries. There are only 46 kingdoms left today, 16 of which are part of the British Commonwealth, leaving only 30 other monarchies among the 191 countries in the world. The small number of monarchies still in existence gives us one possible answer to the question of why the tradition of marrying a member of another royal family has almost completely ceased. The lack of prospective spouses from other royal families meant that monarchs and their heirs had to look elsewhere. The most suitable social class in Britain was thought to be the nobility, whose members were familiar with the royals and their duties and pastimes. This was considered more important than the feelings and compatibility of the individuals themselves, and unequal marriages between royals and non-noble commoners, however strong the feelings of the couples, were actively discouraged. You can ask Prince Andrew and Koo Stark, Princess Margaret and Peter Townsend, the Duke of Windsor and Wallis Simpson, etc., who paid the price in the British family. Diana has also influenced many couples in the royal circle, especially the Queen's children. After all, wasn't she the one who introduced Sarah Ferguson to Prince Andrew in 1985? The two women were good friends and could share their conjugal experiences and crises. Eventually, Fergie made the first step toward leaving the royal family; her separation from Prince Andrew was announced on 19 March 1992, only six years after they had walked up the aisle. Diana was not far behind; her separation from Prince Charles was made public nine months later, on 9 December 1992: an "annus horribilis" for the Queen and, for the monarchy, a real fiasco. If we consider that Princess Anne divorced in 1989, the odd one out in the family was Prince Edward, who married Sophie Rhys-Jones in 1999, two years after Diana's death, and who has not (so far) experienced the humiliation and pain of a high-profile divorce. It has also been theorised that Diana's outspoken refusal to stay in an unhappy marriage influenced the Duchess of Kent in her desire for more personal freedom. 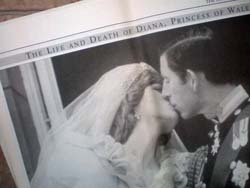 Is it Diana who created this marital explosion, or was it just time for the royals to experience a side of life that was more and more common in British families? The divorces of the Queen's children, especially the high-profile and bitter divorce of Charles and Diana, showed that something was seriously wrong with the system. Modern marriage is about the two people involved, not about alliances between countries or great houses, and young royals expect to find personal fulfillment in their marriages like anyone else. Other monarchs with heirs of marriageable ages must have looked at the debacle of the Wales marriage, and its near-disastrous consequences for the British monarchy, and wondered about the wisdom of pressuring their own sons into "suitable" marriages with high-born girls they barely knew. Would the heir to the Norwegian throne have otherwise been permitted to marry a single mother with a rather colourful past? Would the heir to the Spanish throne have been permitted to marry a divorced woman? The King of Norway and the King of Spain understood that there was far less to lose by agreeing to these marriages than taking the risk of drowning the monarchy by forcing their heirs to contract a marriage doomed to failure. The Queen of Denmark may well have had Charles and Diana's bitter divorce - and the gleeful reaction of the gutter press - in mind when her younger son and his wife, Prince Joachim and Princess Alexandra, decided to end their marriage. The divorce between the Danish prince and princess was as civil and discreet as could possibly be wished for, with neither party running to the press with damaging revelations about the other or using their children as very public bargaining chips. The temptation to do so must have been strong at times, but they only had to remember the Wales divorce to think better of it. The cordial terms of the divorce meant that Alexandra kept a royal title (Her Highness Princess Alexandra), and even after her remarriage she was known as Her Excellency the Countess of Frederiksborg, since this title was granted to her personally by the Queen shortly after the divorce and was not dependent on her position as a member of the royal family. This was a marked contrast to the way Diana was stripped of her HRH after the divorce. Although it seemed that it was Diana's own choice to give up her title, and she had said as much in a statement to the media, the acrimony between Diana and the royal family meant that the Queen received a considerable amount of negative press for what appeared to be a rather mean-spirited act. Queen Margrethe, by contrast, managed to negotiate the pitfalls of her son's divorce and emerge with praise for her sensitive handling of it. In her refusal to submit quietly to an unhappy marriage, Diana thus made it possible for other princes and princesses to have a chance at happy marriages of their own. Photo taken by Flickr member Mig_R and used with permission. Photos of Princess Mette-Marit and Princess Letizia from the Royal Forums avatar collection.